Often, garage door springs are ignored or not given the attention needed. They are some of the most frequently used parts of the garage door, so it’s only logical to pay attention to maintaining them properly. They have to always be in their best condition to avoid sudden problems that are bound to become frustrating. Broken springs are not an uncommon problem for garage doors. If you are not familiar with the proper ways of doing garage door maintenance and if you want to avoid the need for a major garage door repair, we can provide convenient assistance. Our company offers a maintenance service package to inspect, adjust, or replace your springs as well as other vital parts of the door in your garage. It is important to remember that door springs, torsion springs in particular, can be risky to handle. They can cause serious accidents if troubleshooting, adjustments, or repairs are improperly done. We offer an affordable solution that can provide you peace of mind with the assurance that your springs, cables, hinges, and other important door parts will not fall out of place unpredictably. If maintenance is no longer going to cut it, we have experienced and highly skilled technicians at “Garage Door Repair Tiburon” who can provide proficient troubleshooting and repairs on your doors as soon as possible. No spring problem is too complicated for us to not have the necessary solution. Additionally, we have complete tools or equipment to ensure that the repairs on damaged or weakening door springs and other moving parts like the cables and hinges, are proficiently completed. 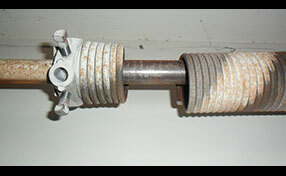 Garage Door Repair Tiburon always strives to deliver the best services possible, even for simple door spring problems. That’s why we invest on trainings and the equipment and tools necessary in undertaking quick and efficient troubleshooting, repairs, or replacements. Expect knowledgeable and friendly personnel when you schedule a garage door spring repair job with us. Don’t hesitate to contact us for all of your door spring problems and other related concerns.